One of the most remarkable personalities in world history, Frederick II, a religious skeptic tried and failed to win the loyalty of the people of Putiganano. Holy Roman Emperor from 1220 until his death in 1250, bloodless ruler of the Kingdom of Jerusalem, he was also King of Sicily, from 1198 to 1250, where he was raised and lived most of his life. His legend still continues in the present, perhaps because it was said he would one day return to unite the Mediteranean for a millennium. 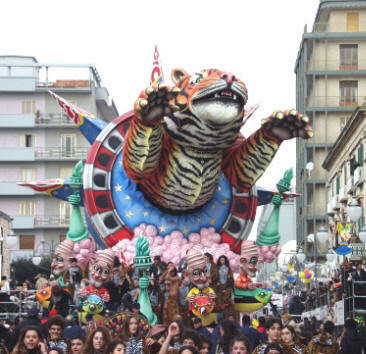 The Carnival of Putignano is one of the three most important Italian carnivals together with Viareggio and Venice. Bari (bä'rē) , city (1991 pop. 342,309), capital of Bari prov. and of Apulia, S Italy, on the Adriatic Sea. It is a major seaport and an industrial and commercial center. 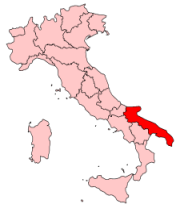 It is connected by road, rail, and ship to other Adriatic ports and is now connected by road to Naples. BY PLANE: Bari International Airport ( www.seap- puglia.it ) inaugurated its new Terminal on March 2005. There are low cost direct flights to London (Ryanair), Koln and Stuttgart (hapag lloyd express: www.hlx.com ) and other international direct flights to Monaco (Lufthansa) Bucarest and Timisoara (clubair), London (British airways), Tirana (Ada air). Besides there are several domestic flights with Italian Hubs linked with all Europe with Alitalia and Sky Alliance: 5 flights per day to Rome Fiumicino, 7 per day to Milan Linate and 3 per day to Milan Malpensa. Other Italian cities linked: Venice, Turin, Verona, Trapani). Brindisi Port: Direct ferry boats with Greece and Turkey. From Nord Balkans is ok also Ancona Port and then by Car to Bari. Hotel “La chiusa di chietri” (4 star hotel, www.lachiusadichietri.it) beautiful hotel located in the wonderful countryside: hills, Olive trees, oaks, typical rural rock houses called “trulli”. POLIGNANO A MARE (20 km): the birthplace of worldwide famous singer Domenico Modugno (Mr. Volare), very romantic and old city on the sea. PUTIGNANO: Visit to the Carnival float hangars, the caves, the old city with the beautiful St. peter Church in romantic and baroque architectures. A Trullo (plural, trulli) is a traditional Apulian stone dwelling with a conical roof. It is only found in the Italian region of Apulia that in Italian is called Puglia (pronounced "Poolia" in English); it is not found in any other Italian region or country of the world The vast majority of trulli have one room under each conical roof, therefore a multiroomed trullo house has many cones representing a room each. The norm was a large single room with very thick walls. A very full immersion in the best of Apulian gastronomy, wines, music, culture and folklore. For over seven centuries Putiganano was "nullius", that is to say, it was directly under the Pope's dependence for both temporal and spiritual powers. For 200 years it was governed by Benedictine rule and by the Maltese Knights until 1808. Frederick II, who valued and respected Putignano, tried to win over her fidelity by building a castle. However when Putignano refused access into the city after a hunting expedition because of her undying loyalty to the Pope, he had the castle, together with the walls, destroyed, after only a few years. Description: Height 12 mt., Length 10 mt. Width 10 mt. After that September all seems to have changed, you are not safe in any part of the world. America who appeared invincible was seen to be unable to deal with such a catastrophic situation. At the centre of the float the crown of the Statue of Liberty has been placed, from which emerges a mammoth tiger with open claws that attack the Kamikaze responsible for the slaughter. America wounded, but with fight in her, retaliates declaring was on terrorism.